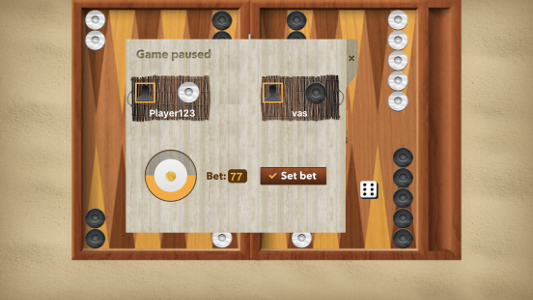 When two players play an online game, one of them may place a bet. The opponent can either accept the bet or reject it. There is no limit on how many times a player will try to place a bet. Later, if the first bet is accepted, any of the two players can raise the bet. As before, the other player can refuse this raise. When the game is over, the winner earns the bet. 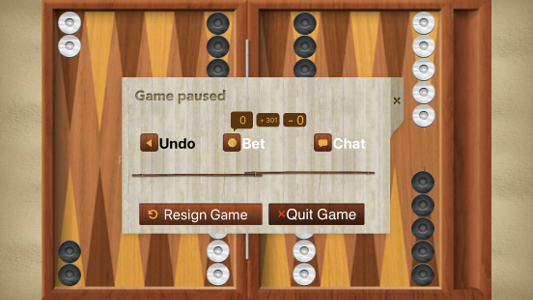 If the game is not finished (because one of the player has abandoned the game, the other player will earn half the value of the bet). It is clear that when a player earns a bet, the opponent loses one. Thus, at the end of a game, the winner is rewarded with the coins of the bet, and the looser loses the exact same amount of coins. We place a bet via the menu. Tap on the "Bet" button to bring a new menu up and set the bet. The opponent will receive a message asking him/her to accept or reject it. 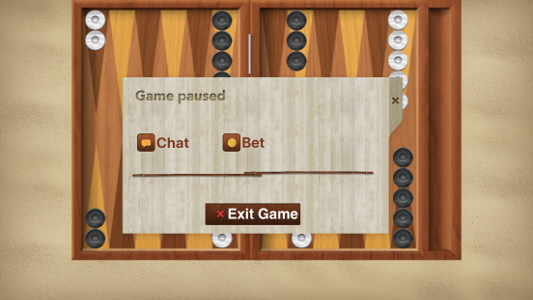 At the top of the "Bet" button there are three labels: The first one indicates the value of the bet that is being placed between the two players. The second label indicates the coins that other users have bet on that player, and the third label the coins that other users have bet against that player. In the current example, the players have not placed a bet, but 301 coins are placed by other users on that player. While other users are watching a game, they can place a bet on a player. This means that they believe that that player will win the game. If they are right, they will be rewarded the amount that they bet on. A user can place a bet on both players or can place multi bets on a single player. If a user places a bet, the coins are immediately withdrawn from his account. Also, no coins are rewarded if a game is not finished. We place a bet via the menu. As before we tap on the "Bet" button to bring a new menu to set the bet. In contrast to the previous case, we now need to select the player that we place this bet on. This is the menu for placing a bet. At the top, we tap on the player that we want to place the bet on. At the bottom we scroll the wheel to set the amount of coins that we bet on that player.